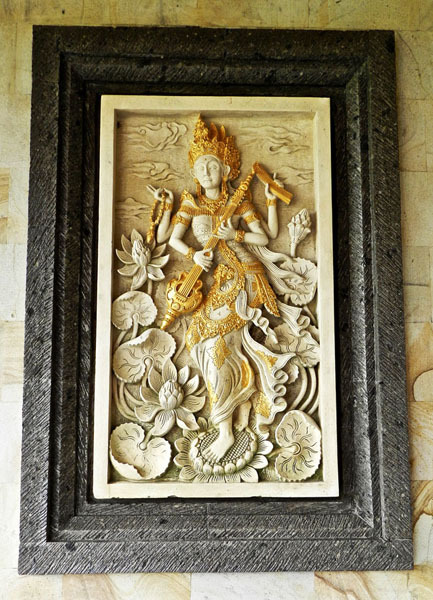 What struck Don about Bali almost from the start is that the sacred is everywhere, and sacred ritual is a part of everyday life. 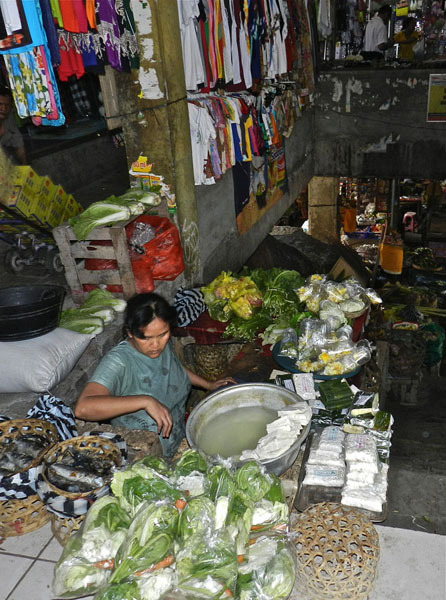 Homes and businesses are blessed, and offerings made to the gods every day. 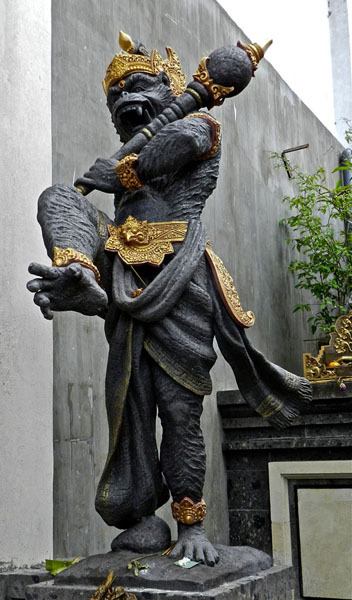 Their religion is a blend of Hinduism, Buddhism and ancestor worship that flourishes to this day. It’s teaching is to reach peace and harmony in life. 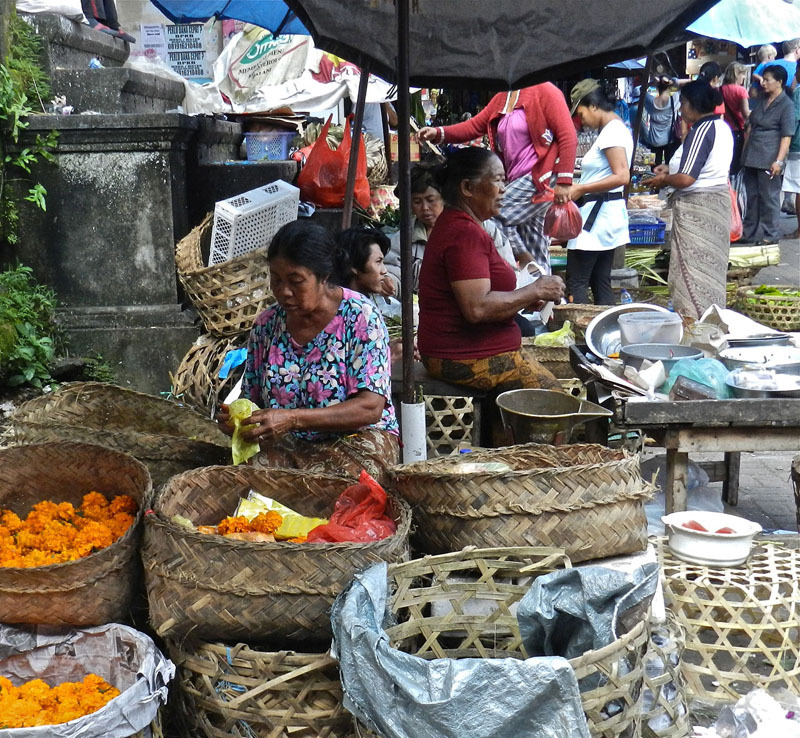 This from Don: I love seeing all the women who go around the streets of Ubud carrying trays of offerings to the gods and put down individual offerings with reverence on the sidewalks, in front of parked cars, and in shop doorways, as well as in front of the many temples. 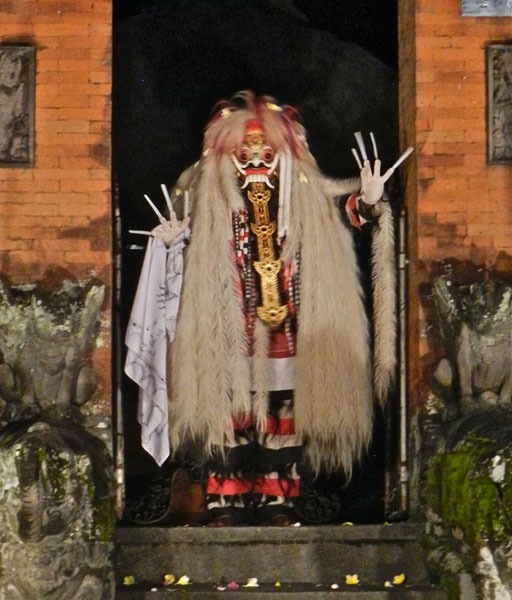 I don’t know if they are paid to do this, or whether it forms a part of their religious observation, but it is a striking example of the spirituality that pervades life here in Ubud. 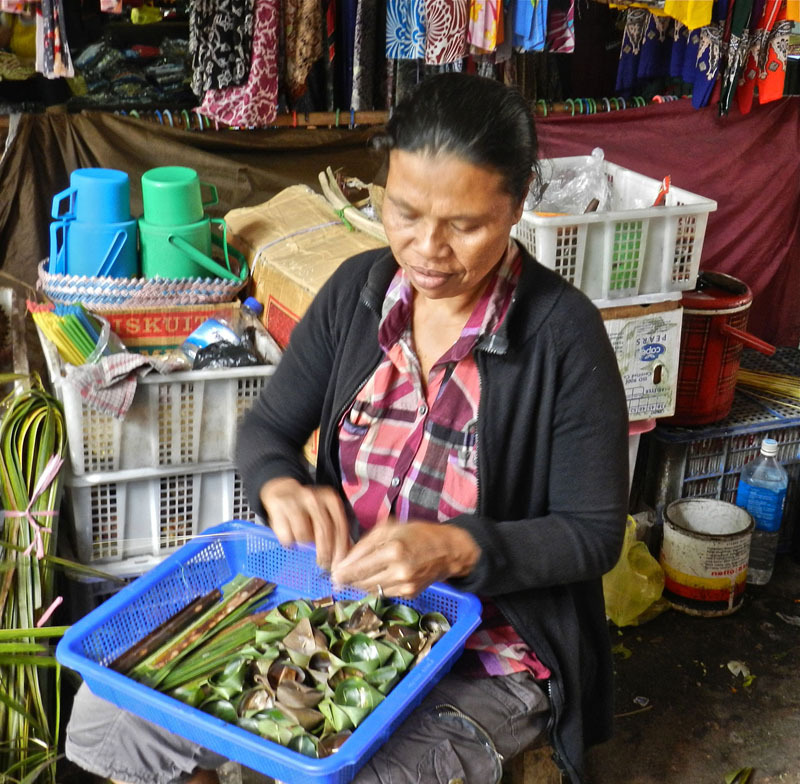 Women doing small ceremonies out the front of businesses – we see this up and down the streets of Ubud every day. 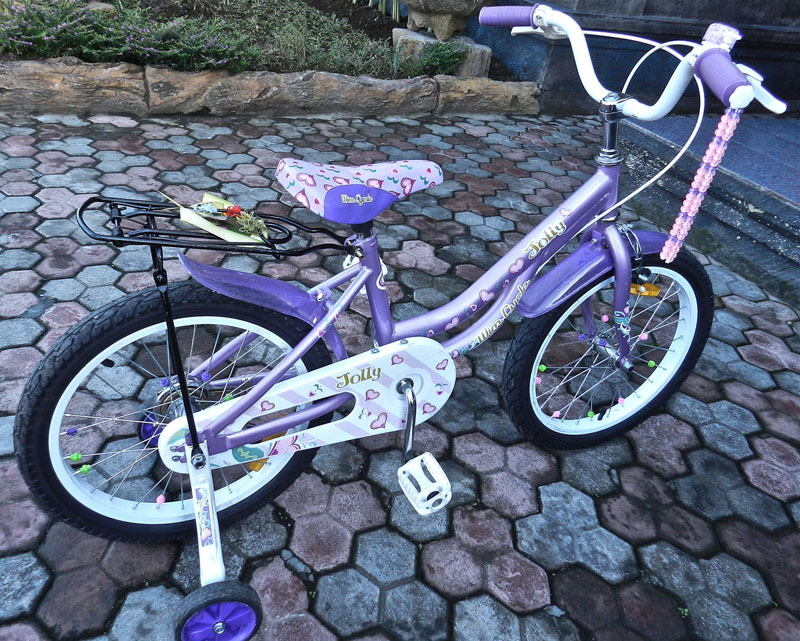 Even childrens’ bikes are blessed. 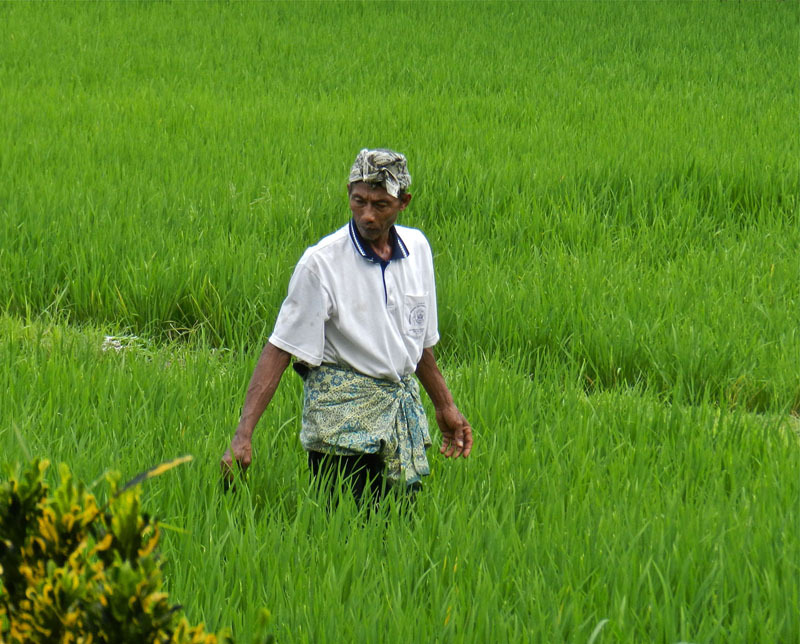 We are staying in a lovely guesthouse overlooking a rice field in Ubud. The view from our porch. The decorative carving on the porch – beauty everywhere. Initially we spent a lot of time on the porch – reading, writing, resting. The first week was time for recovery from India. Don’s guts were still rumbling and he needed to focus on eating well and resting. He’s fine now. I fell hard walking round Arunachala two days before we left India. I bruised my knee very badly but nothing broken thankfully. So I needed time for healing too. Anyone who knows me well knows what an ardent fan I am of figure skating. During the first week we were in Bali the world championships were being held so I was more than happy to stay put and rest glued to the computer. 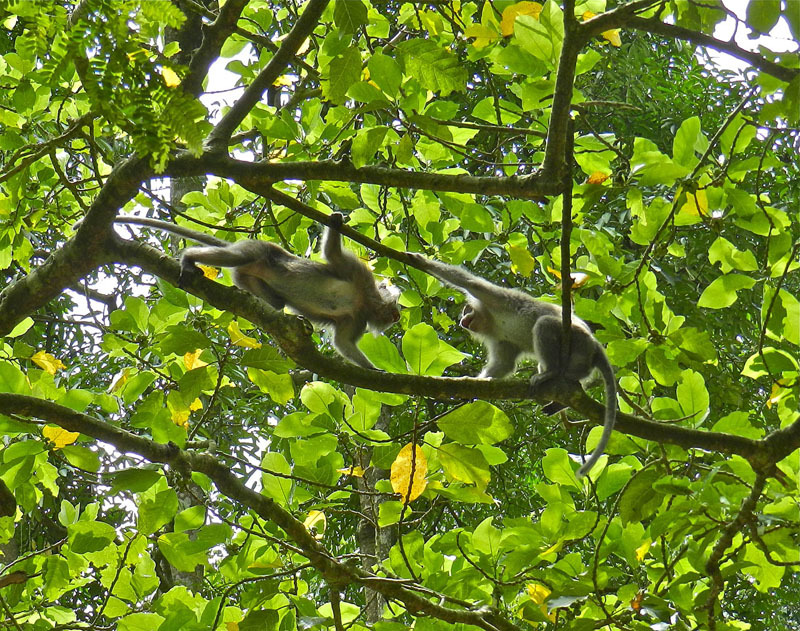 We still saw quite a lot during that first week or so although we didn’t go out much, and didn’t leave Ubud. 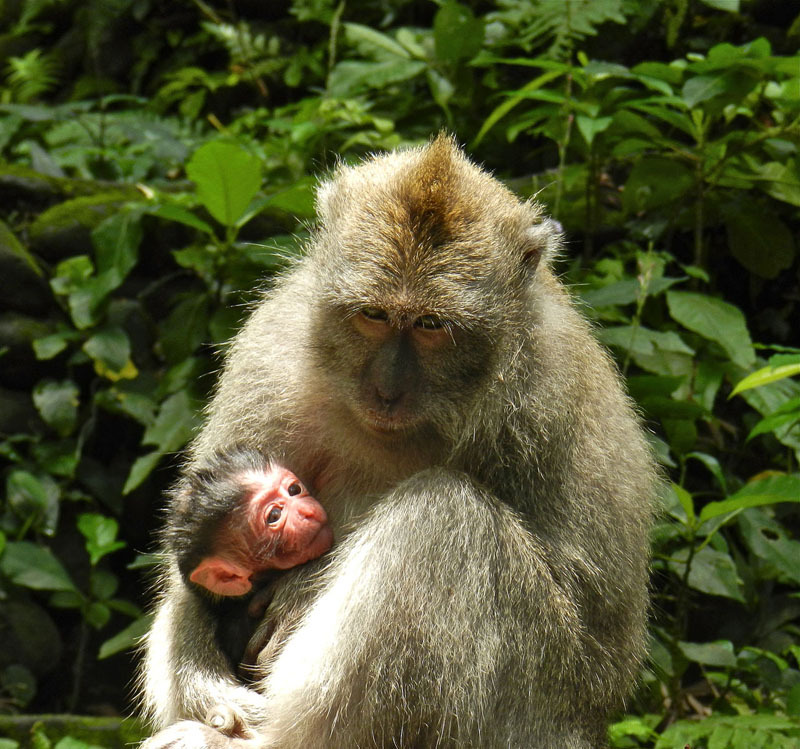 We went to the sacred monkey forest populated with long-tailed macaques. It was a bit scary. There’s so many of them, new babies to big old ones, and they are everywhere. Very entertaining but you wouldn’t want to make any of them feel threatened. Big teeth! One of them jumped on Don’s back. Fortunately it was a small one, and got off again pretty quickly. 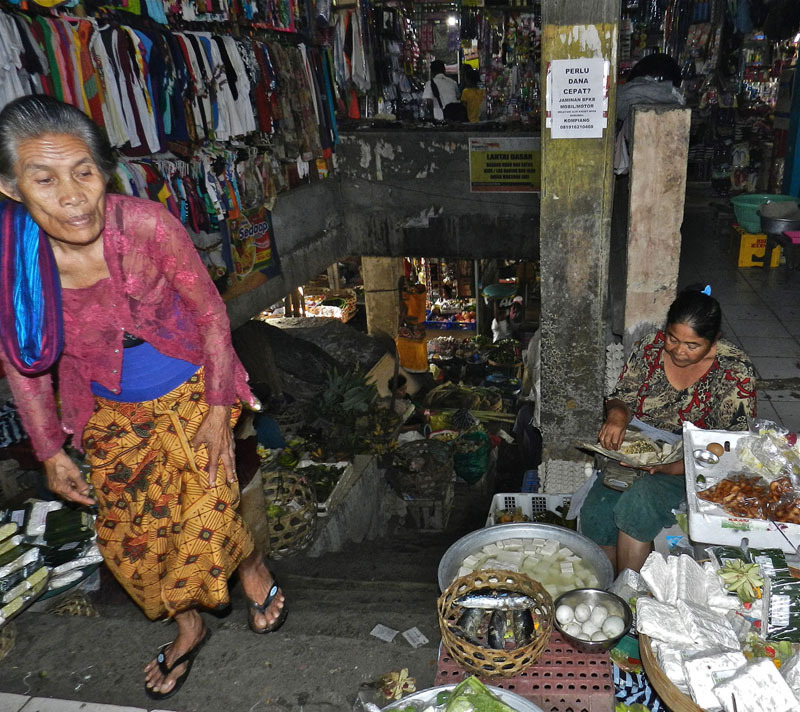 We went to the market to buy Balinese clothes for Don so we could attend spiritual ceremonies. I am completely staggered by the amount of merchandise available for sale here in Bali. It’s overwhelming. Every market stall is overflowing with stuff. 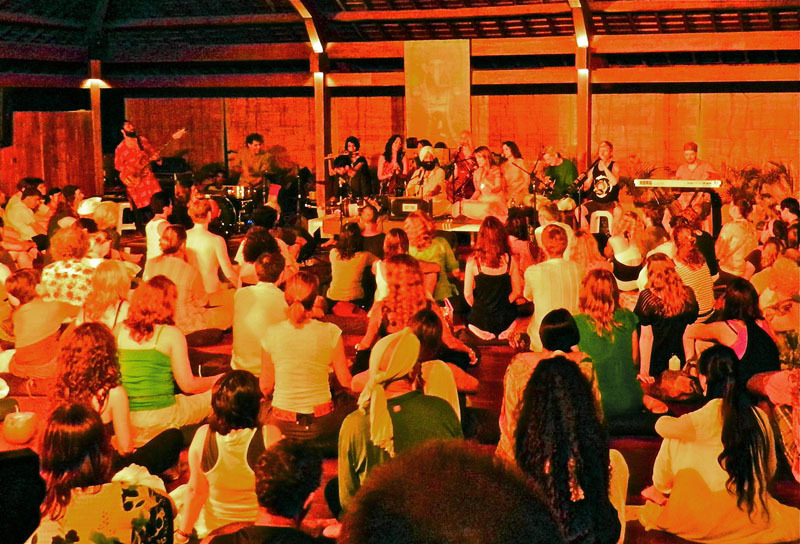 We went to a kirtan night of singing mantras and dancing that was happening as part of the Bali Spirit Festival. 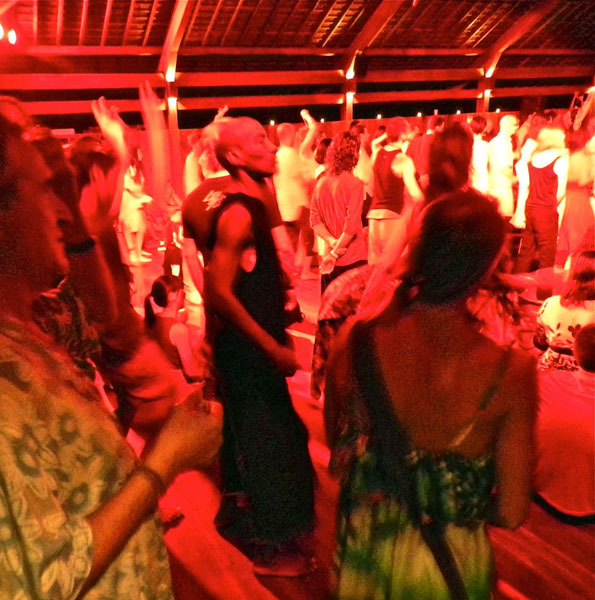 We went to the Kecak and fire trance dance, which was amazing. 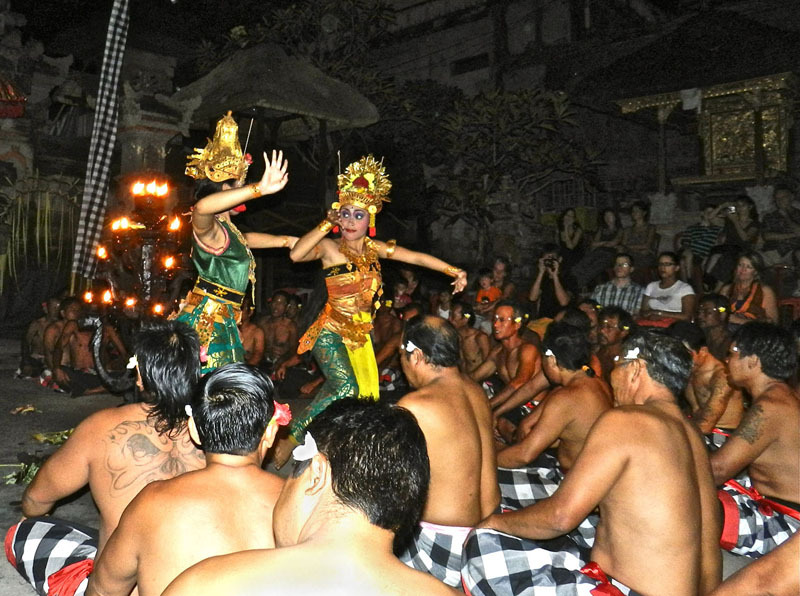 The Kecak dance has about 50 or more men in a circle sitting/standing/crouching/swaying as the story unfolds, and making rhythmic music with sounds and clapping. 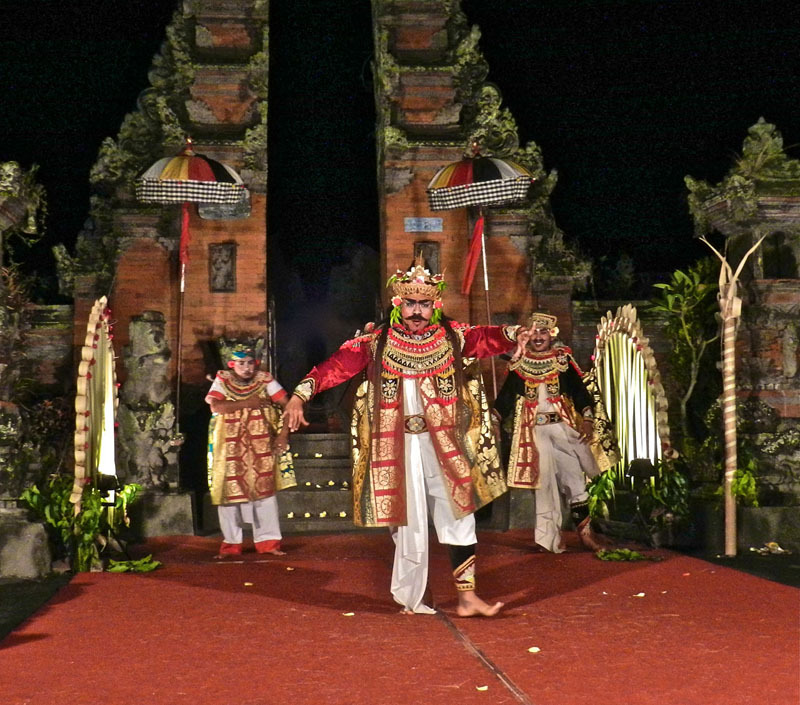 In the centre of the circle dancers perform the story of a fragment of the Ramayana. It is way too complex to explain the story. There were so many characters I couldn’t keep track, and that’s only for a fragment. The whole performance was fabulous: intriguing and colourful and rhythmic. Following the Kecak dance a huge pile of coconut husks was dumped in the centre of the circle, smothered with an accelerant and lit on fire. When it had burned down a bit a man danced around it “riding” a fabulously creative horse made from coconut palm. It became clear he was in a deep trance. Suddenly he leapt into the fire and with his bare feet he scattered the burning coals out in all directions, then continued to dance. Two other men raked all the burning coals back to the centre. Again the man on the horse jumped into the fire and kicked the coals out in all directions. Again they were swept back into the centre. This continued four or five more times until there was almost nothing left of the coals. Then they grabbed the man on the horse, wrested the horse from him and held him down until he stopped moving. He was so deep in trance he probably would have continued dancing until his body collapsed from exhaustion if they hadn’t stopped him. After a while a priest came and gave him a blessing with water, and eventually he was able to get up and walk away. It was amazing, and entirely genuine. I don’t have any pictures but there’s a great one here. 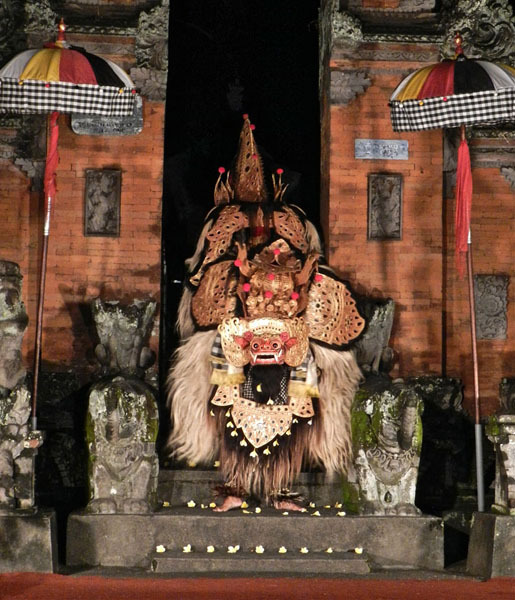 On another night we went to see the Barong Dance. What a fabulous piece of theatre. 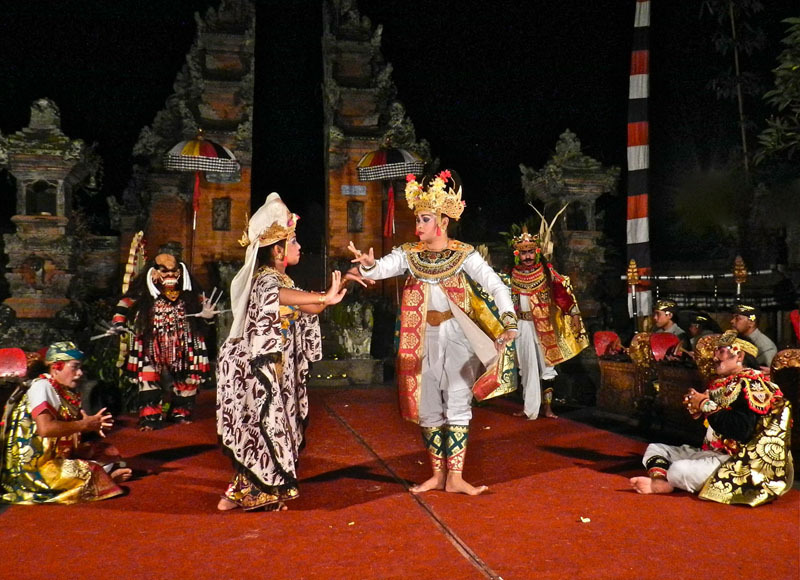 It is the Balinese equivalent of pantomime (at least the version we saw was) and depicts through symbolism the eternal struggle between order and chaos, and the never-ending tension and need for balance between the two. People have remarked that we’re following the same route as “Eat Pray Love” with Italy last year, then India and now Bali. It’s true, though completely coincidental. We certainly didn’t go to Italy to eat, neither of us being big fans of the Italian diet. You can only eat so much pizza, pasta and olive oil. 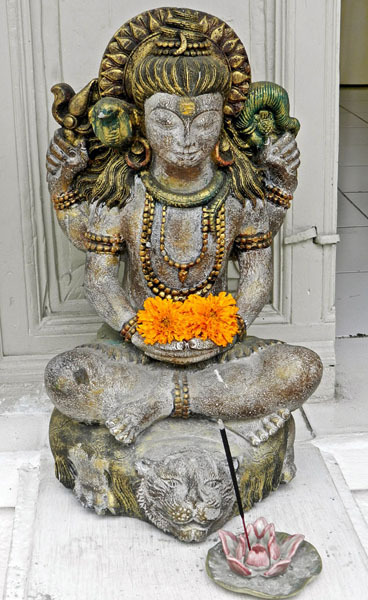 Certainly we did a lot of praying and meditating in India, but Bali is the place for food for us. The food for westerners here is absolutely fabulous. Don’t think we’ve been this healthy for a while – organic vegetarian and a heap of good restaurants to choose from. We don’t often eat Balinese food, neither of us being fans of hot spices, though we ate breakfast at a private family ceremony and dinner at a wedding and found plenty to eat that we enjoyed. 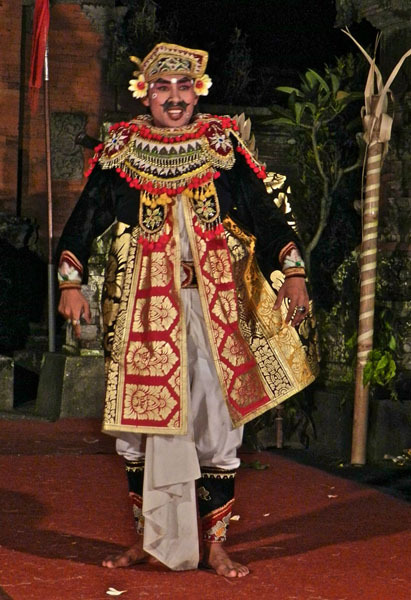 We love Bali. Everyone we know who has been here said we would, and they were right. Next blog – The above mentioned ceremonies. A day trip to the beach and a bird park. A trip to the rice fields and volcanoes. Snorkelling at Blue Lagoon. 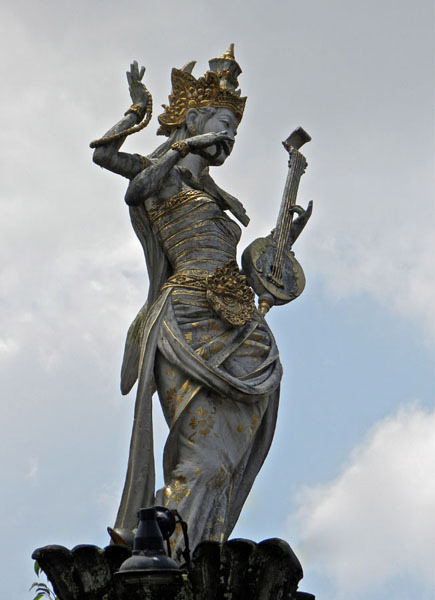 Fascinating- Bali really does attract my attention. 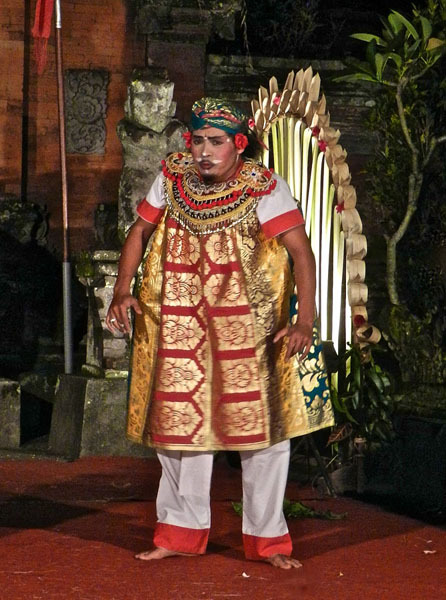 Bali is wonderful, and we will probably go back next year. 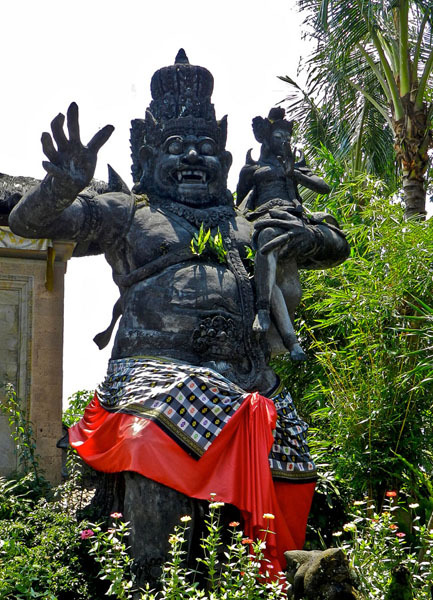 It’s been a tourist mecca for years, and just as we’d never go near Pukhet or Pattaya in Thailand, we’d also never go near Kuta in Bali (too bad all those Aussies didn’t stay on a beach at home to get drunk) but there’s lots of Bali left and we had some amazing experiences there. We never have been back to Bali. It seems there is always more of the world to explore. I think we would still enjoy it – there is something so special about the culture there. Thank you so much. 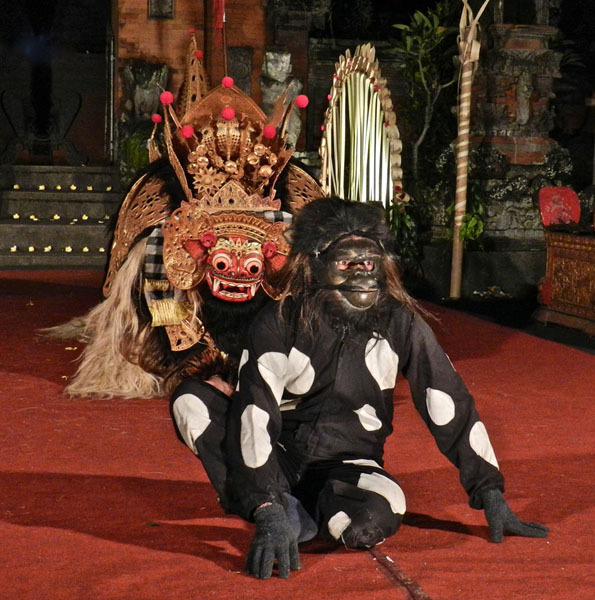 We had a wonderful time in Bali. 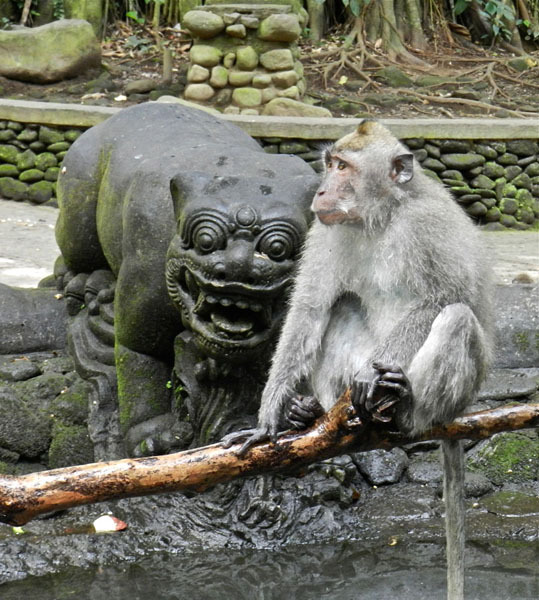 Bali looks so beautiful – I hope to go at some stage and just wondered, if I were only able to go for about 10days and wanted to spend some time on the beach and some time exploring cultural activities, which parts of Bali would be best seen in a short period of time and how long in each? I’d be so grateful for any advice you may have for me! Hi whywasteannualleave. 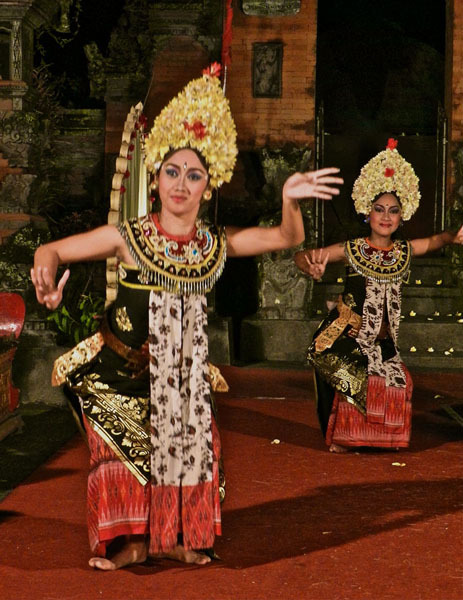 For cultural activities definitely Ubud is the place. There’s a beautiful beach to the north of Ubud called White Sand Beach if you like a relatively quiet beach. Another good beach is Nusa Dua used mostly by the locals. If you want a tourist party beach go to Kuta in the south. The island is tiny so you can get a driver to take you from one place to the other for not much. 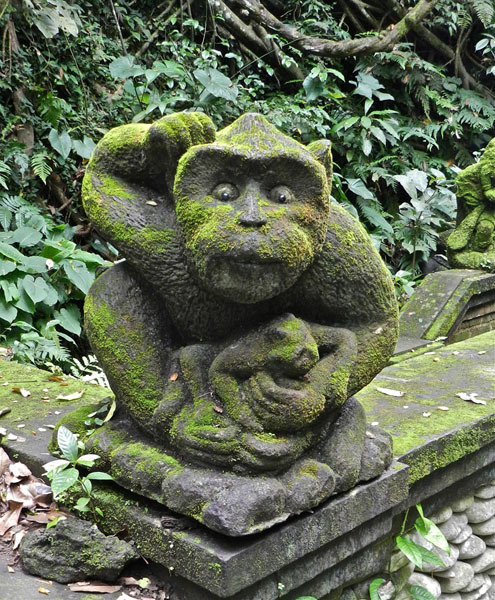 If you’ve read all our posts about Bali you’ll see we stayed in Ubud the whole time and did day trips to many interesting places. 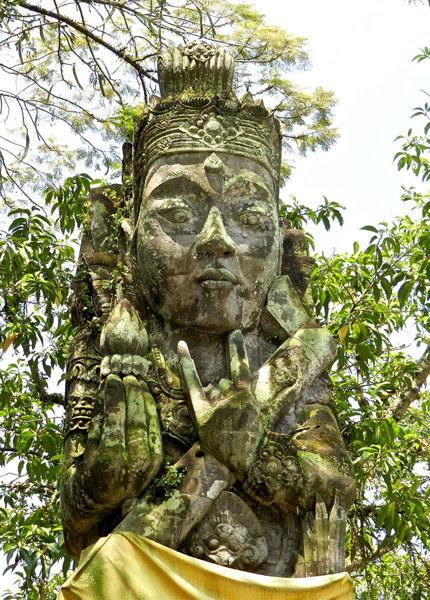 You could spend about half your time in Ubud, and the other half at a beach location.